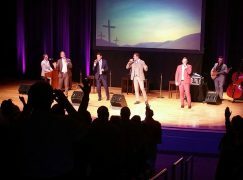 Day 1 of the 2015 National Quartet Convention is now part of history. 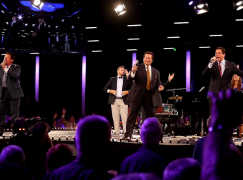 I have attended at least three days of every NQC since the late 1990s with the exceptions of 2011 and 2012. This was the first year I have attended the Sunday night “bonus” concert, however. 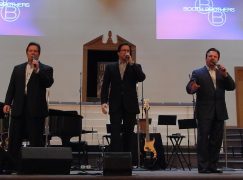 Featured groups for Sunday evening included the Jim Brady Trio, Mark Trammell Quartet, Hoppers, Tim Lovelace and Greater Vision. 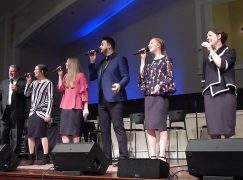 I was expecting something a bit more informal than a regular evening concert at NQC, but they had everything planned down to the minute and listed in the program book just like the rest of the week. About the only thing different was that each act did two sets, and with the final act going on at 9:25 PM, it was all over before 10:00 PM. The rest of the week, concerts should run later, up to another hour and a half give or take. Now, on to some more technical observations. As I’ve said in the past, the venue in Pigeon Forge is just too small for the size of event NQC is putting on, but I do credit the NQC board for making several improvements over 2014. As soon as they walked in, the friends I traveled to NQC with this year gravitated toward the new elevated seating at the back of section 115. We sat just one row down from the back, and this is one of the sections that sits in the corner of the room. In other words, we were as far from the stage as possible, save one row. You’d think based on the distance to the stage that it would be one of the worst areas to sit in the room. My friends love the elevated seating so much, though, that they are talking about “upgrading” their Mon.-Wed. seats in 2016 to ensure they can be on the risers every night. I’m going to see about working that out for them. Other improvements include larger and more video screens and staggered seating (so you’re not staring directly at the back of the head of the person in front of you). These improvements were announced a few months ago, and while subtle, both do make the overall experience better for the fans. Another improvement was the way the entire room was “dressed.” Last year, it looked like we were in a huge warehouse. This year around the outside walls, there are black curtains behind each section of seats. Between each set of black curtains is a vertical beam of colored light. That setup should look great on television or DVD. The colors were changed throughout the evening. Tonight, they were only using about half of the available seating. An illuminated curtain backdrop was used behind the stage like they typically had in Louisville for afternoon showcases. I would estimate the crowd at 3500-4000 people. About a third of the available seats were filled. There were a few sound issues, but nothing embarrassingly bad. 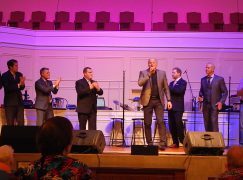 There was some occasional feedback when the Mark Trammell Quartet was singing. The bottom end didn’t really make it back to where I was seated, but keep in mind, I was as far away as possible and in the corner of the room. Only a few groups and organizations arrived on Sunday to set up their booths, but there were more than I expected. The groups that performed on Sunday already had their booths in place, obviously. The halls were pretty empty. It’s the calm before the storm hits tomorrow night. Speaking of storms, that’s what is predicted for most of this week…not just rain, but thunderstorms. (If I get wet, I may melt. Salt dissolves in water just like sugar does.) Seriously, please do pray for safety for NQC attendees. The parking lot situation/location is still not ideal. Add some thunder and lightning, and it’s only going to make matters worse. I will plan to use my good camera to grab some photos on Tuesday and Wednesday evening when my seat is very close to the stage. I’m not sure if I’ll take it Monday evening, since my seats are at an awkward angle. On Sunday, I only took one fuzzy shot on my camera phone. The detail is washed out and it’s grainy, but I’ll go ahead and include it here since it shows the angle from the risers.